The Toyota Corolla is sold in over 140 countries. Launched in 1966, it became Japan’s best selling car in 1969, and stayed that way through 2000. With over 30 million cars sold, the Corolla is the world’s best-selling car — ever. The Toyota Corolla is the best selling car in the world, and no wonder. It has peppy acceleration, agile handling, excellent fuel economy, and a smooth, comfortable ride. 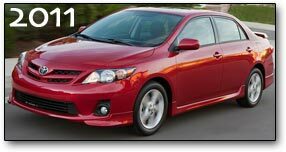 The Toyota Matrix, a station-wagon version, is suprisingly sporty, and has its own interior.